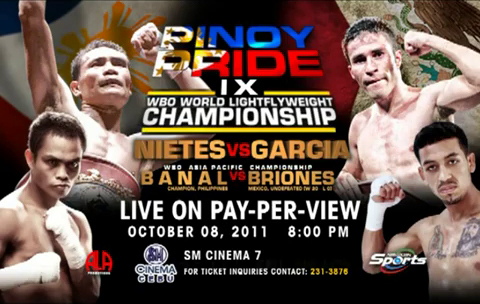 Pinoy Pride 9 Results: Donnie "Ahas" Nietes defeated the former Mexican champion Ramon Garcia Hirales via 12-round unanimous decision victory held at the University of St. La Salle Gymnasium, Bacolod City in Negros Occidental, Philippines, Saturday night of October 8, 2011. Nietes took the opening round as he threw more accurate punches than Garcia Hirales. Early rounds went to the challenger Nietes. But starting of round 6 Ramon Garcia took the advantage of the fight because Nietes started to slowed down a little bit as he hung on after 1-2 punches. Referee Robert Byrd gave warning to Ramon Garcia Hilares in punching back of the head which gave to Donnie Nietes a big problem. Nietes landed some good uppercuts and straights but suffered a cut above on his left eyebrow. However, many was impressed with Garcia on what he have done in the fight. He was very determined to defend his title. Garcia's camp was upset in the result of the scorecards 115-113, 118-110 and 117-111 favor all to Donnie "Ahas" Nietes. Donnie Nietes was a former World Boxing Organization (WBO) Minimumweight title holder and now the newly crowned World Boxing Organization Junior Flyweight Champion of the World. He was a janitor before but now he is a two world division champion. AJ "Bazooka" Banal retained his WBO Asia Pacific Bantamweight Title against Mario Briones of Mexico via 12-round unanimous decision victory. Albert "Prince" Pagara, 17, showed what in defeating the Tanzanian boxer Shabani Madilu via 8-round unanimous decision victory. Madilu was down in rounds 1, 2 and 4.